Back to the Studio for a few hours this afternoon. Some of the time was spent refining the two figures. Both are closer, but both still need a little work. The rest of the time was spent putting in the inner structure. This print will make use of some of the typical imagery of Robert Ryan, friend of the Studio and the tattoo artist who allowed me do some sketches of him at work. 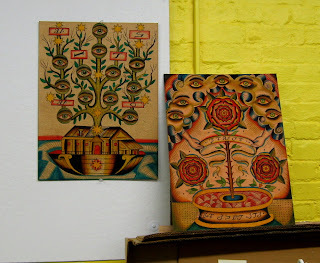 His paintings often include shapes like those added to the right panel, inspired by the mandalas found in some Eastern religions. On the left side I matched the composition, but this time with flower designs common to Japanese tattoos. Like with the figures, today's additions are just roughed in for now, and will need to be reworked before the drawing is done. After spending some time looking at the results, I think I will need to either make changes to the chair he's sitting on, or even remove it completely and continue the mandala design down further. With the possibility of some winter weather over the next few days, and the potential difficulty of passing through Belmar tomorrow (Belmar's traditional two weeks early St Patrick's Day parade), I decided to bring the block home with me to work on. A very very busy day today. Just after breakfast I put together two carousels of slides for tonight's class, a woodcut project. Later in the afternoon I'd be driving down to Island Heights to pick up the 3 pieces I had in the print show at the Ocean County Artists Guild. From there I drove to school to get ready for class. 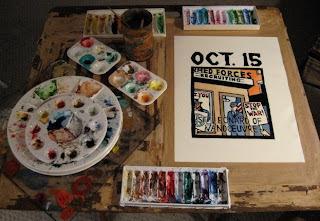 But the big event today was finally starting work on the next block in the boardwalk series, the tattoo studio. The idea for this one has a few sources. One was a particular individual I knew who would come to the shore each year and take a break from her job there to get a tattoo, once on the boardwalk. (Wildwood, if I remember correctly) At all the boardwalks you can get at least a temporary tattoo if not a real one. Another is the ubiquity of tattoos these days, and the relatively little clothing typically worn on the boardwalk in summer reveals many of them. And then there's the tradition and history of tattoos. Archaeological evidence shows that tattoos existed in every corner of the earth, even back in prehistoric times. Mostly decorative or symbolic marks, or sometimes words. Tattoos fell out of favor in the more developed parts of the world, but continued to be part of the culture of many tribal peoples, especially in the Pacific. The big change started in Japan, not coincidently at around the same time as the ukiyo-e prints. To that point, tattoos were generally illegal, but different rules applied in the Floating World. What made them particularly innovative was that these Japanese tattoos weren't just decorative pattern, but true wearable art, sometimes covering much of the body. 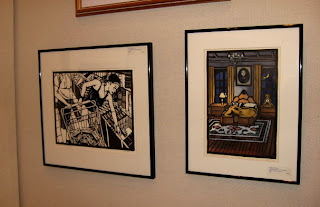 Multiple colors, making use of the style of art and imagery found in woodcuts- sometimes even being done by woodcut artists with woodcut tools. Just as international trade brought Japanese woodcut prints to the western world, it also spread the popularity of tattoos. Sailors (military and merchants) adopted the traditions of Japan and the Pacific islands. There was a spread of tattoo artists in port towns around the world to meet the demand. Boardwalks are not exactly ports, but they both have in common that they are right on the water. And since modern tattoos have a lineage back to the Japanese prints that helped inspire this series, it seems an appropriate subject for a print. Back last fall I did some sketches in a local tattoo studio. Nothing much happened right away after that, but earlier this year I went over that material and started thinking about how I could use it for a print. 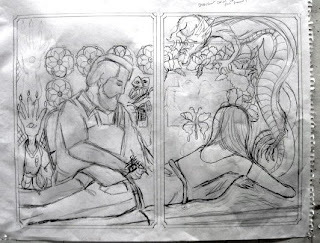 What I came up with is shown in the top photo, spreading the scene across the two panels of the triptych, with the artist contained in the left side panel. I showed this to the artist himself a few weeks ago, explaining what I planned to do with it, and he approved. The next step was to produce what's seen in the second photo, a full size sketch on paper. The left side will include art based on work by the artist (both his tattoos and his paintings), while the right side will use typical Japanese tattoo images. (I'll explain all this in more detail as I'm drawing it on the block) There will be a rough symmetry between the two panels. I didn't fill in all the details, but after taking it this far, I felt the direction is right and I can figure out the rest on the block. Today I didn't have much time, but I did get as far as roughing in the two figures. Both will require further adjustments, but it's a good start. Today's visit to the Studio was short but productive. I cut a 16" long piece off the 24"x48" board that I bought yesterday, marked out a section the size of the diptych for the next boardwalk print, and applied some woodfiller. 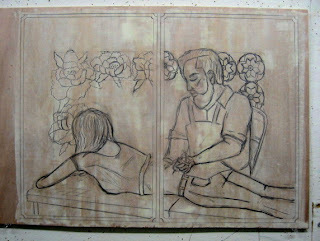 Later I would sand it smooth and draw the panel borders for the two halves of the print. I expect to start drawing on the block later this week and I'll tell the whole story at that point. In between the above I was coloring two previously finished, but recently printed saints. I worked on both simultaneously, going back and forth, giving parts time to dry. At the end of the day, I had another finished copy of the St Leonard of Vandoeuvre print that I plan to enter in an upcoming show. I also had a colored copy of the St Hunna print requested out in Iowa. These were two things that suddenly came up in recent weeks, but with these finished, I can go back to the piece I'd been working on. Don't know what it is lately, but it seems like it's getting harder to get a nice flat piece of wood. Pretty much everything I see is a bit warped. (Molly is even dealing with it with some of the 3/4" wood she uses for her tabletops) A few weeks back I cut a piece off a board to be the next boardwalk print, and noticed a significant amount of curving across the surface. Might still be usable (the last boardwalk block was also warped, but in the other direction- concave instead of convex), but I'm trying to press it flatter. Meanwhile, I decided to see if I could find a better piece of wood now. Stopped off and bought what looks to be a suitable piece on my way to the Studio today. I'm not ready to deal with that yet, so for now it sits on my table. What I did today was cut up the pieces I bought last week for my classes. As you can see from the top photo, each has some warping across the whole sheet, but this isn't as problematic. Cut to about 8"x6", each small panel is pretty close to flat. Cut out 36 total pieces, gave the rough edges a quick once over with coarse sandpaper to remove the splinters, and took half home with me for one of my classes this coming week. The other half will be needed in a different class a few weeks down the line. Last night I set up my watercolors in my living room, put the image of the best earlier proof of St Leonard on my computer, and wandered back and forth between the two, filling in the colors while various science fiction shows played in the background. I brought everything back to the Studio today, where the better light let me take the second photo, the finished proof. I'll probably go back in tomorrow and color the other proof, using this one as the model. 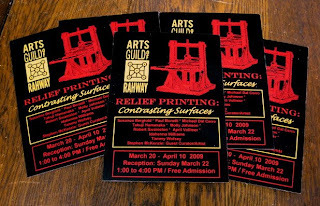 Got the postcards for the upcoming relief print show at the Arts Guild of Rahway. Happy to see that my name is spelled correctly- not something I can ever take for granted. Ten artists from the region will be in the show, which will open March 22. I'll post all the details when the date gets a little closer. 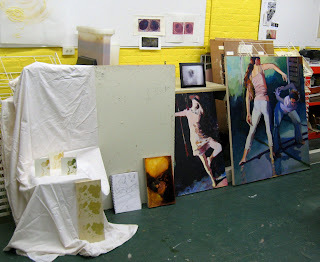 A brief visit to the Studio today. 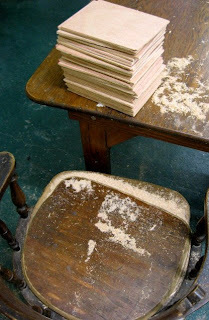 Used the big tables to grade a pile of student work. But mostly I was there to work on one of my recent saint proofs. I taped one of the Leonards to a board. I brought it back home, along with all my watercolors. Since the only image I have of the final version is on my computer, I'll work on it at home over the next few days, where I can compare what I'm working on with the image on the monitor. Today I went into the Studio for a while. The layout sketch for the next boardwalk print is still in progress, so today it was other business- printing some previously finished saint blocks. One of these is a commission. My friend in Iowa had requested a saint several years ago, dated with his daughter's birthday, and so I created one for that day. More recently a second child has come along, so a second print was requested. It happened to be that this second date is one I already had done back in the original Carbondale batch, St Hunna. John and his wife weren't sure if they liked the image, a vintage washing machine (St Hunna was known for doing the laundry of her needy neighbors, gaining the nickname "The Holy Washerwoman"), but this past week he called me and mentioned that they will take the St Hunna print. I told him I'd make him a fresh copy (3/5). Yesterday I found the block in my basement, and today it was printed. Another block I printed today is a more recent saint, St Leonard of Vandoeuvre. This is for the PCNJ show I mentioned a few posts back. The prospectus comes with a very long essay by the juror, which is mostly about his father's philosophy, a mix of Catholicism and Zen Buddhism, with an emphasis on messages of peace, compassion, and brotherhood. This is what he'll be looking for in the work. As it turns out, just about the only prints that I have ready to go that meet the restrictions on not being previously shown and completed in the last 2 years are some recent saints, which would seem to be perfect for this show. I can submit three prints, and have five saints to choose from. St Eustace is nice, but the dead animal head on the wall might not be appreciated. (in the original story he doesn't kill the deer, but the juror might not know that detail) St Thecla doesn't seem likely to offend, but it doesn't particularly speak to the theme either. Neither does St Budoc, but the shared wine could be part of a broad idea of friendship. St Januarius seems like a good possibility, the donation of blood often promoted as a compassionate act. 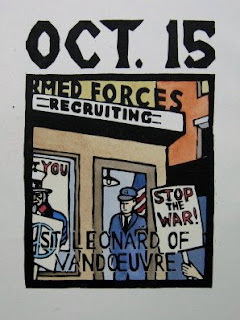 But the most obvious one is St Leonard, with its anti-war theme. The only problem is that I can't find the previously finished copy. Also couldn't find it in the fall when I was framing up newer saints for the Iowa show, but I had enough other prints to show not to need it. Can't put it off any longer. I printed 2 copies today, so I should have at least one to shoot for the submission in a few weeks. Coloring will start later in the week. Nice sunny warm day (warm for February anyway), but with some serious winds- 60 mph gusts. Made driving around interesting, weaving around fallen branches and avoiding flying debris. The biggest challenge was after I stopped to buy a few pieces of lauan, to eventually be turned into small panels for my students to do their woodcut projects. The pieces were small, only 24" square, but still it proved to be a challenge to carry them through the parking lot to my car. The wind was swirling around in all directions, so sometimes I needed all my strength just to push against the wind, and sometimes I had to hold tight to keep them from being ripped out of my hands. 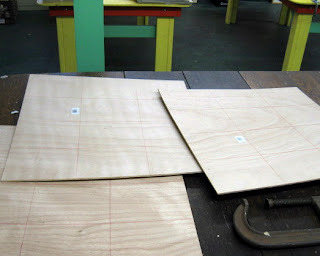 I dropped them off at the Studio, to be cut into panels some time in the next couple of weeks. 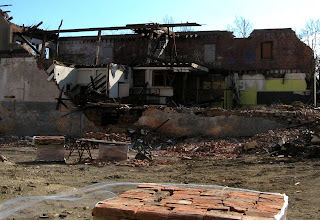 Meanwhile, the gradual destruction of the annex building that was once connected to the building has progressed to the point where only one section is left. I opened the window of my Studio a crack to see what was left and was immediately hit in the face with some heavy dust (or very tiny little gravel small enough to pass through the window screen). Very quickly closed that window and went around the building to take the above photo. I had to take care of some business at my university today, so I went in early this morning, leaving me many hours of time to fill before my class. Part of it was spent doing more preliminary work for the upcoming boardwalk tattoo print. Went online and did some sketches of some samples of Robert Ryan's artwork, both painting and tattoos. I also tried to do some research in the library, but I couldn't find any tattoo related books. In the afternoon I added some bits of the morning sketches to the large paper sketch I have in progress. Some of the additions are working better than others, so more changes are likely soon. I hope to have the main elements in place by the weekend. 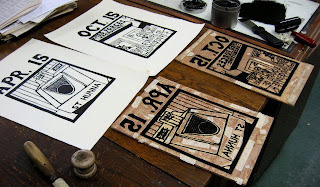 The U.S. mail brought a prospectus for a juried show at the Printmaking Council, called "What Does It Mean to Be Human?" Comes with a long juror statement, explaining the philosophy behind it. The show will appear in two NJ locations, then go overseas. Kind of short notice, with images due in about a month, not enough time to create something new. And as usual, the requirements are works completed in the past 2 years and not shown there before. The only things I have that meet the rules and seem like they would meet the theme are the recent saint prints. No entry fee, so there's no risk to enter, so I may as well do it. However, it does bring to mind a past event. Several year back they put together a big juried show called Humanity. Don't remember exactly what I submitted, but I do remember that I was rejected from the show. What's worse, the piece that did win best in show was an image of a fish. Never did figure out what it had to do with humanity. Just can't predict these things. Off from work today, so I had made arrangements to meet with Robert Ryan at his tattoo shop. I was there last fall doing some sketches of him in action to use in a print for my new boardwalk themed series. That print is now next on my schedule. I have spent a bit of time over the past month looking at those location sketches, doing a little library research, and beginning to think about the composition of the new diptych. At the moment I'm at the rough scribble stage, nothing worth showing today, but I'm far enough along with the idea that I wanted to talk to Rob to get a little more background. Some of the imagery that I want to use will be adapted from his art, both his paintings (like those seen above in one of our Studio critiques) and his tattoo work. He was able to give me some information about that, as well as hook me up with some more reference material. I'll work on getting a more finished sketch on paper done over the weekend. When I post that I'll give the full story behind the print idea. Meanwhile, since I was just a short distance from the Studio and pointed in that direction anyway, I went up there and cut a piece of plywood to the size I'll need for the print. We had a pretty good crowd at Critique Night tonight, this one falling just 3 weeks after the last one. In all we had 9 people show up, and though not everyone showed work, everybody participated in the discussion. 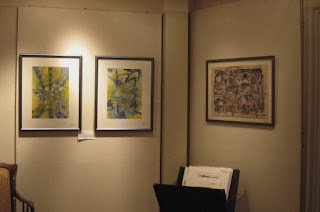 Shown in the photos are tonight's works on display. 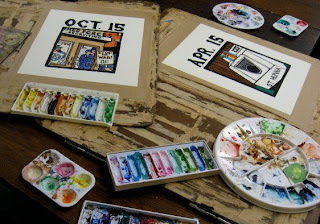 The top photo shows Mary's prints, Tim's almost abstract photo (he always surprises us), Pat's paintings of dancers, Adam's painting of engine parts, my sketchbook, and some of Molly's silkscreened trees. 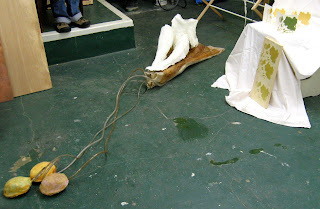 Molly's work can be seen in the second photo as well, along with Jane's mixed media sculpture. (Guido and Sandy were there, but did not bring work to show.) As we ran long, I didn't really present my work tonight, except to correct Tim's mistaken belief that my sketch was of Santa Claus performing accupressure on someone. I hope to have something more to show next time. 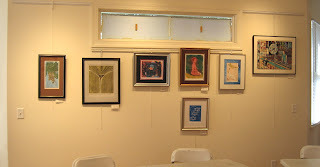 Today was the reception for the Printmakers Invitational exhibition at the Ocean County Artist's Guild in Island Heights. Very light traffic this afternoon, so I got there plenty early, getting a parking spot close by. 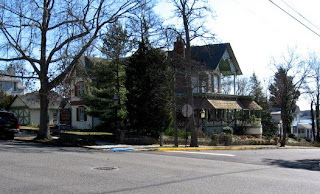 The OCAG is located in the large Victorian shown in the top photo. Most of the 1st floor is still set up according to the original floor plan, though there is a large annex on the back. The front room looks probably as it originally did, but after that visitors pass through two small rooms set up as galleries. The print show was located in the second such room. 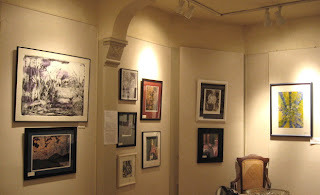 My two smaller contributions were in this room, side by side, as seen in the 2nd photo. 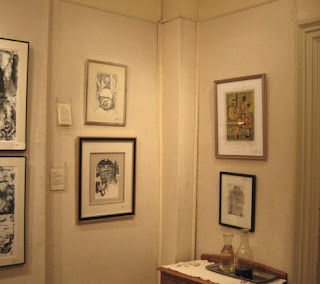 The next 4 photos show the rest of that room, with such print media as intaglio, linocut, reduction woodcut, monotype, and digital represented. The last photo shows my 3rd contribution, the boardwalk print, which was on a wall in the annex gallery, along with the other overflow pieces from the print show. People started arriving shortly after 1 pm, and within a half hour, the place was getting crowded. 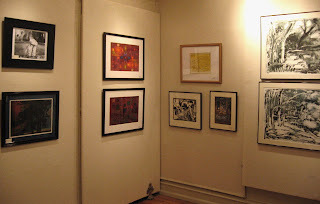 I would estimate that about 75-80 people came through at some point, including several of the artists in the print show. My Solitary Man print got a lot of attention, at least a little of that due its being used on the postcard. Talked to a lot of people today, explaining my process (especially the hand coloring) and discussing the narrative sources (supermarket and boardwalk mostly). For most people there, my work is like nothing they've ever seen before. The exhibition remains open through February 25, the gallery open Tuesday to Sunday, 1 to 4 pm. Admission is free.